The film is set in 1985 and stars Tobias Schenke as Tim Winter, a West German teenager from Bremen with aspirations of being a professional tennis player. On a school trip to East Germany, Tim meets his identical twin brother Ronny (also played by Tobias Schenke). Ronny switches places with Tim, forcing Tim to experience life and love in East Germany. As I didn't grow up in the East, I cannot say how accurate the potrayal of the life in the GDR is (I'll have to take Karsten word for it, that it's very accurate). Therefore I concentrated on the love story. And in my opinion it fell a little flat. It may be because I found the main character very unlikable, even later on. And I couldn't see why Jana fell for him. The question came up, if it is comparable to "The Life of Others". I wouldn't compare it to that movie. I would say it's more a movie like "Goodbye Lenin!". From the creators of the smash hit ‘Bend it Like Beckham’, comes BRIDE AND PREJUDICE a romantic comedy with a Bollywood twist! Lalita Bakshi (Aishwarya Rai) is a strong-willed yet sensible young woman from a traditional family with three sisters, a long-suffering but loving father and a mother anxious to marry them to wealthy young gentlemen. A sensational mix of witty comedy, vibrant colours, fantastic musical numbers and stunning dance routines. This movie is from the director of "Bend It Like Beckham". It is the Bollywood take on "Pride & Prejudice". If you want to get your feet wet with a Bollywood movie, but don't want the typical length and do not want to read subtitles, then this movie is a good way to start. It is an English production. In a way it pays homage to Bollywood movies, but at the same time it parodies them. The beginning for example it plays with the notion what would happen, if you take an American movie character and throw him into a Bollywood movie. The movie is also good introduction to the Indian way of life and customs, which you will encounter in a number of Bollywood movies. This movie has typical Bollywood song and dance numbers, but also typical Hollywood musical numbers. The female star of this movie is a big Bollywood actress. Also the actor who plays her father I have seen in a number of Bollywood productions. Carl Allen has stumbled across a way to shake free of post-divorce blues and a dead-end job: embrace life and say yes to everything. Take a bungee plunge? Yes. Learn Korean? Yes. Grab the first flight to anywhere? Yes. Win your dream girl? Yes. Crack up fans with a feel-good, laugh-loaded comedy? Yes! Jim Carrey plays Carl in a YESCapade about opening up to life's possiblities - especially when those possibilities include romance with an intriguing, free-spirited musician (Zooey Deschanel). 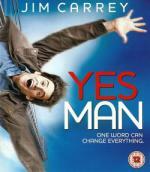 From the director of The Break-Up comes an invitation to discover the comedy power of YES. I enjoyed this movie. If you like Jim Carrey, I think this movie is well worth checking out. Strange that Terrence Stamp seems to pop up in a lot of movies I watched recently. Before is role as the voice of Jor-El on Smallville I only knew him as General Zod. I never saw him in anything else in-between, I think. At least not consciously. Don't forget The Phantom Menace! Or Wanted... I've seen a lot of him over the years with him being one the most dependable British actors. Other films you may have seen him in are Wall Street and a starring role in The Limey. That last one is odd, but very good. Wanted, Get Smart and Yes Man are examples were I have noticed him in recent times. I was not aware that he was in Phantom Menace. Phantom Menace is a bit of a surprise to me too. I own and have watched The Limey ( ) and of course I have seen Wanted. Wall Street is too long ago. But yes, he is usually very dependable in his roles. Having been brought up in London, Raj (Sharukh Khan) and Simran (Kajol) are second generation British Asians, who still cherish their Indian roots, culture and values. The two meet in a chance encounter jwhile traveling through Europeon an inter-rail holiday. When they get seperated from theirfriends, they discover each other...they discover LOVE! When they return to london, Simran is taken back to India, for an arranged marriage as per her fathers wishes. Now Raj must go to India to win his Dulhania and asks Simrans father for her hand in marriage and seek acceptance of their love-all this, while Simrans wedding is in full swing. Dilwale Dulhania Le Jayenge released in 1995, is the longest running film of Indian Cinema. Aditya Chopra's debut film became one of Hindi cinemas biggest blockbusters sweeping 10 Filmfare awards and the Natinaol award for popular and wholesome ebtertainment. Sensitively and often poignantly scripted, the film has a sweet, innocent freshness that makes not Simran and Raj (perhaps Kajol and Sharukhs best performances) but all the other characters so real that you love, laugh and ache along with them as if they lived next door. I enjoyed this movie. The first part is essentially a road movie, where the two main characters meet, do not like each other at first but eventually fall in love with each other. The second half consists of trying Raj to prevent Simran marrying to an arranged marriage by forcing himself into the life of her family and win their hearts. This movie is one of the most successful Bollywood movies. Even now, after almost 15 years, it still runs in Indian cinemas (the longest running movie in India). It is a first for the screen couple, who went on to do more movies together. I already reviewed three of those (in two of which they ended up as a couple). Phantom Menace is a bit of a surprise to me too. When 11-year-old Altaaf is orphaned during a violent attack on his home by state police hunting a rebel leader, he is adopted by Inayat Khan, the kindly officer in charge of the raid, and his loving wife Neelima, whose son has just died in a freak accident. Altaaf's dream life with his new parents is shattered, however, when he discovers the man whom he now call his father is also the task force leader who tragically gunned down his family. Fleeing Kashmir, the boy grows up under the tutelage of Hilal Kohistani, a brutal militant leader dedicated to a jihad seeking the independence of Kashmir. After ten years, Altaaf returns as Hilal's instrument of destruction on a mission of annihilation, revolution and revenge. Unexpectedly, he reunites with Sufi, a beautiful long-lost childhood girlfriend, and finds himself torn between love and hatred, brutality and humanity, and forgiveness and vengeance in this thrilling action adventure where the past meets the present to decide the future of a nation. A good action drama. This time though I thought, that the musical numbers didn't fit the type of movie. And Preity Zinta should have had more screen time! But otherwise the conflict between the characters is done well. Sorry to bring this up again, but I was rather amused to see it was Terence Stamp's birthday yesterday! Here we were chatting about the old bugger and he just happens to blowing his candles out... small world. Happy belated Birthday, Mr. Stamp! Yes, he played some sort of senator, I was checking at IMDb afterr my above post, just didn't feel my findings were important enough to edit my post. Gopal, the rich businessman who got married to Radha. Gopal loves his wife from his childhood. He expects lots of love from his wife that Radha does not understand from the beginning. She always cares about her jobless brother Prashant and talking to her childhood friend Suraj. Suraj is a famous Singer. He is encouraged and supported by Radha from his childhood. Gopal does not like Suraj & Radha's relationship. So a mis-understanding starts between them. Finally Gopal sends Radha back to her home. Suraj comes to know that he is the reason for the separation of Gopal & Radha. Gopal and Radha finally realize their problems & resolve their mis-understanding. Radha goes back to Gopal without any further complexities & they lived together happily. How does Suraj solve the problems between Gopal & Radha? Watch 'Hum Tumhare Hain Sanam' to find out! This movie started very weak, mainly because of the direction. But the story got engaging nonetheless. This movie shows how a marriage can break apart because of everyday misunderstandings. Shah Rukh Khan's character slowly gets eaten up by the jealousy over his wife's good relationship to a good friend of hers. He plays it well, though maybe a little too over-the-top. The movie guest stars Aishwarya Rai, who plays the leading role in the English Bollywood movie "Bride & Prejudice" I have reviewed recently. As mentioned before, I bought this German release, not knowing that it's from the publisher "Eros International". And sadly again the quality is sub-par. It is inexcusable for a DVD release in late 2008 to be non-anamorphic with badly framed picture. At least there was no "Eros" logo this time around. Also they do not understand, that the cover text shouldn't summarize the complete movie! A triumph on every level, this magnificent achievement set a standard for modem movie musicals that remains unsurpassed to this day. Featuring an unforgettable score ("Maria," "America," "Somewhere," "Tonight") and groundbreaking choreography, the film sets the tragedy of Romeo and Juliet against the backdrop of gang warfare in 1950s New York. Starring Natalie Wood, Richard Beymer, Russ Tamblyn, Rita Moreno and George Chakiris, West Side Story is a stunning piece of visual entertainment and the best film musical ever made! I have never fully watched this movie before. It has some great songs and the point of the story is good, but I didn't like the execution all that much. A few great choreographies and direction, but overall I didn't like it much. Maybe it's blasphemous, but I enjoy star-crossed lovers stories in Bollywood movies much more. Somehow they do love-at-first-sight stories more believable. My favorite scene of the movie is the "wedding" in the bridal shop. My favorite song is the obvious: "America". There are three kinds of married people in the world. First, whose marriages are arranged, I've never quite understood that, but I'm sure they know what they're doing. Then there are those who fall in love and marry their soul mates. These few, I believe, are the most fortunate people in the world. And lastly, there are those couples that marry for their parents, for money or play it safe and marry a friend. These are the most unfortunate ones in the world - and they don't even know it. Until one day, riding the fast train of life they run into their soulmate, and are faced with the hardest question of all. What do you do when you meet the love of your life and you're married to someone else? What do you do? A great movie. I liked that the two marriages which are falling apart are not shown as to be entirely of one party's fault. It even goes so far, that as a viewer you almost feel guilty, that you are rooting for Shah Rukh Khan and Rani Mukherji to get together, even though they both have great spouses who do not deserve the heartbreak. This is an all-star cast and all of them did a great job! And though I didn't expect it from this movie, they were several laugh out scenes in it. There is even an in-joke to "Koi... Mil Gaya" which also starred Preity Zinta.